These General Terms and Conditions govern the rights and obligations between charter advisory s.r.o., VAT: CZ03235076, with its registered office at U prvni baterie 796/​2, 16200 Prague 6, Czech Republic (hereinafter referred to as the "Provider") and the Client in providing and arranging domestic and international commercial flights. General terms shall mean these general terms and conditions. Flight confirmation shall mean a document showing Flight schedule and other important flight details including arranged services. Client shall mean person and/​or a company identified in the Flight confirmation. Operator shall mean the operator of the aircraft holding the valid certificate for commercial air transportation. Charter price shall mean price payable by the Client related to services provided by charter advisory, Operator and/​or their subcontractors identified in the Flight confirmation as specified in the related invoice(s). Flight schedule shall mean the point of departure, destination and any stopping points, together with any indications of departure and arrival dates and times, set out in the Flight Confirmation. Scheduled Time of Departure (STD)means the scheduled time of departure as set in the Flight Schedule. Notice in writing shall mean notification of the Provider or the Client made by email or letter, unless agreed otherwise in writing between the parties. Passenger shall mean any person traveling on board of the Aircraft excluding the members of the flight crew or representatives of the Operator. 2.1. n particular, arrange a domestic or international commercial flight for the Client, as per Client’s requirement recorded in the Flight confirmation, either through its own means (aircraft and crew) or through a third party - Operator. The Client's obligation is, in particular, to pay the Charter price to the Provider for the provided services, to comply with the generally binding legislation related to flight safety, to observe the conditions agreed between the Provider and the Client and to arrive for the departure on time. 2.2. The Client acknowledges that the Provider is entitled to fulfil his obligations through a third party - the Carrier..
2.3. The fulfilment of the flight schedule is subject to the carrier's conditions of carriage which the Provider shall provide to the Client upon request. 3.1. In case the Client shows interest in the booking of the flight, the agreement is considered concluded upon confirmation of the flight or the previously sent offer by sending the Flight confirmation from the Provider to the Client. The conditions stated in the Flight confirmation are considered as conditions agreed by the parties. The provisions contained in the Flight confirmation shall prevail over the conflicting provisions contained in the General terms. If a framework agreement has been agreed between the parties, any provisions contained in the framework agreement shall prevail over the conflicting provisions contained in the General terms and any provisions contained in the Flight confirmation shall prevail over the conflicting provisions contained in the framework agreement as well as in the General terms. 4.1. Charter price is the price stated in the Flight confirmation. This price is payable by the client in favour of the Provider. 4.2. The Provider is obliged to issue to the Client an invoice or other proper tax document with all necessary details. 4.3. Any payments from the Client in favour of the Provider are considered to be paid upon the date of being credited to the Provider’s account. 4.5. All other costs, including, but not limited to de-​icing, special license fees, special clearance fees, royalties, fees due to operations outside of the official airport hours, onboard satellite telephone and internet connection costs and any other additional service costs whatsoever and howsoever arising in connection with the Client’s request shall be paid by the Client. Such costs are payable by the Client in favour of the Provider based on invoice issued by the Provider. 4.6. The Provider reserves the right to decline the provision of services until the payment of the Charter price is credited on his account. The provider reserves the right to withdraw from the agreement unilaterally if the Charter price is not paid by the Client properly and in due time. Should the Provider withdraw from the agreement from above mentioned reason(s), the Client shall be obliged to pay the cancellation fees to the Provider in the amounts stated in the Flight confirmation and based on the date of the withdrawal. Any further claims of the Provider towards the Client, including but not limited to any claims for damages, arising from breach of the Client’s obligation are not affected howsoever by withdrawal from the agreement or payment of the cancellation fees. The above mentioned applies in the case of the opening of insolvency proceedings against the client. 4.7. Unless specified otherwise, all payments made by the Client shall be paid via bank wire transfer. The Client is allowed to pay his obligations towards the Provider by credit card, in which case he is obliged to pay transaction fee for credit card payment, which amounts are stated in the Flight confirmation and/​or in the invoice, to the Provider. d) Issuing and providing all documentation necessary for the performance of the flight. 6.1. The Client is obliged to pay his obligations towards the Provider properly and in timely manner. 6.2. The Client is obliged to provide details of passenger(s), including name(s), date(s) of birth, nationality, travel document number(s) and date(s) of expiry, to the Provider in advance, latest 48hours prior to STD or, provided that the flight is confirmed less than 48hours prior to STD, at the nearest convenience without any delay. 6.3. The Client and his passengers are obliged to arrive at the departure meeting point sufficient time in advance. In case the Client and/​or his passengers fail to arrive to the departure meeting point in timely manner leading to non-​ability to provide them with the agreed service, such event has no influence on the Client’s obligation to pay the Charter price. 6.4. 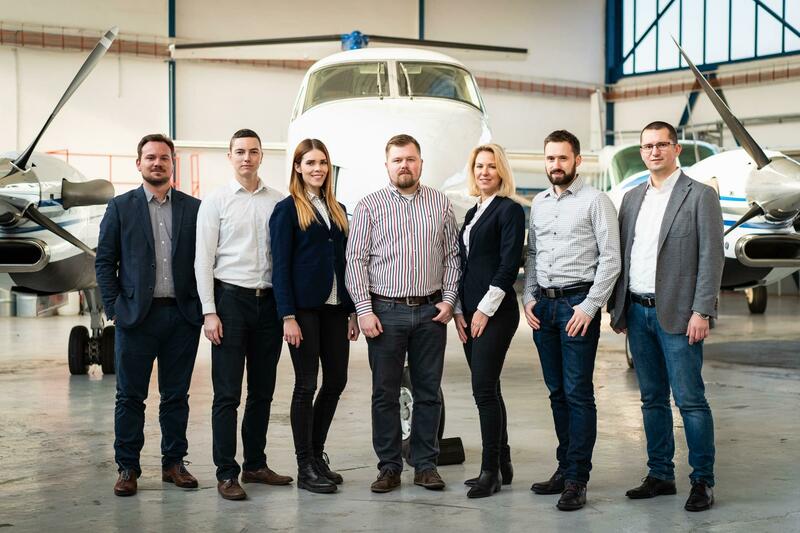 The Client is obliged to act during the flight in such way that no damage to the property of third parties, especially to the operating aircraft, shall occur. The Provider shall not be liable towards the Client or his passengers for any damage caused by the Client himself or his passengers that occurred during the provision of the services. 6.5. The Client hereby acknowledges and undertakes to comply with obligations stated by general legal regulations and international laws and regulations related to air transportation as well as requirements and conditions stated by the Operator during the operation of the flight and in the area of airport. The Client undertakes that such obligations are fulfilled by himself and his passengers. The Provider is obliged to inform the Client about general legal regulations and international laws and regulations related to air transportation as well as the specific requirements and conditions stated by the Operator upon the Client’s request. 6.6. The Client and passengers are only allowed to board the aircraft with proper travel documents, have the required vaccinations and without being under influence of addictive substances. 7.1. Provided that the aircraft identified in the Flight confirmation is not airworthy to operate the full schedule stated in the Flight confirmation or the part of it, the Operator is entitled to unilaterally substitute the aircraft with other aircraft which is airworthy and available to operate the schedule stated in the Flight confirmation. If such aircraft is not available in the Operator’s fleet, the Provider is entitled to offer the substitute aircraft from other operator. In such event the agreed Charter price is not applicable and the confirmation of the new offer is equivalent to confirmation of new agreement. In case the Client refuses the alternative offer, such refusal shall be considered equivalent to withdrawal from the agreement and the agreement shall be terminated. Such termination as described above shall be governed in a reasonable extent by Article 10 of these General terms. 7.2. Provided that the flight schedule is operated with a substitute aircraft of the other Operator, the flight schedule shall be performed subject to the terms and conditions of this operator. 7.3. Shall the flight schedule not be realized from the reason of arrival of the Client and/​or his passengers to the departure meeting point insufficient time in advance, the proceedings stated in Article 10. will be used in a reasonable extent. 7.4. In the event of flight delay from the reason of late arrival of the Client and/​or his passengers to the departure meeting point resulting to extra costs, the Client shall be liable to cover such costs to the Provider. 7.5. In the event that flight is operated partly from the reasons caused by the client and/​or his passengers (mainly in case of extra landing), the Client is still liable to cover the charter price. If any extra costs occur in connection with the event described above, the Client shall be liable to cover such costs to the Provider. 7.6.4. If, in the event of force majeure or exceptional circumstances, the aircraft will not be able to land safely at the arrival destination specified in Flight confirmation including positioning flights, and will be diverted to another location, the transport is considered as finished. 8.1. Any cargo transported by the Client or at Client’s request must be packaged adequately. 8.2 Weight and dimensions limits of the baggage are subject to aircraft type used and the Client is obliged to respect these limitations. The Provider is not responsible if any part of Client’s and/​or passenger’s cargo is excluded from the transportation from the reason of not meeting requirements or limitations of the Operator or the operating aircraft. 8.3 Transportation of dangerous goods must comply with the applicable IATA regulations and such transportation must be notified to the Operator, consulted and approved by the Operator. No legal claim is applicable for the transportation of dangerous goods. 8.4 Transportation of living animals on board is subject to the aircraft type used and Operator’s conditions of carriage. No legal claim is applicable for the transportation of living animals. The transportation of living animals is subject to prior notice and approval by the Operator. The Client and his passengers are responsible to fulfil all legal and veterinary conditions associated with the transport of living animals on board and their arrival to the destination. 8.5 The Provider shall notify the Client about Operator’s conditions of carriage upon Client’s request. 9.1. The Provider shall not be held liable for delay or cancellation of the flight or its part caused by reason he cannot influence (force majeure) including, but not limited to, actions of third parties (strikes, riots), weather conditions, technical failure, incident or accident influencing the flight. 9.2.5. any act, neglect, default, omission or negligence of a client or his passengers. 9.3. The Client agrees that his sole recourse for any claims arising out of performance of the flight schedule or any part thereof (including delayed, partial or non-​performance) shall be carried against the Operator according to European Commission regulation number 261/​2004. 9.4. In the event the Client incur damage or loss that is not mentioned under the Article 9.2. from the reason of breach of the obligations of the indemnitees or the Operator, the Provider is liable towards the Client for the damage or loss incurred up to a maximum amount equivalent to the charter price. The liability of the Provider for any damage/​loss towards the Client whatsoever exceeding the Charter price is excluded. 9.5.5. any other claims being subject to above stated clauses 9.2.1. – 9.2.5. The Client is solely liable for any damage resulting from his own gross negligence or willful misconduct. 10.1. The Client is entitled to cancel the flight unilaterally without specifying any reason. In the event of cancellation of the flight by the Client, the Client is obliged to pay the cancellation fee stated in the Flight confirmation to the Provider. The Client is also entitled to cancel one or more flight segments, in such event the Client is obliged to pay the cancellation fees as stated in flight cancellation. 11.1. The Provider and the Client hereby undertake to keep all important information confidential (all sensitive information obtained by the parties in connection with the agreement). The Provider hereby undertakes to keep confidential especially the information about providing the service at all, dates, times and locations of the transport of the Client and his passengers, passenger names and details and charter price. 11.2. The Client especially undertakes to keep the Charter price confidential. 11.3. The above clauses concerning confidentiality apply adequately to passengers, employees, subcontractors and business partners of the Client and the Provider. 12.1. Any provisions of this agreement are subject to laws of Czech Republic including the event if the establishment of any claims occurred in the territory of another state. 12.2. Any disputes connected with the agreement shall be governed by the courts of Czech Republic. 12.3. Any communication between the Provider and the Clients shall be realized either by e-​mail or by post. 12.4. The Provider is entitled to send invoices (or other tax documents) to the Client by electronic correspondence, with the effect of delivering the original documents. The Client agrees with such way of sending tax documents. These general terms are valid from 22. 2. 2019. Set your departure airport or your departure place and we can help you to find suitable airport. Set your arrival airport or your destination and we can help you to find suitable airport. If you do not know exact date for your trip, leave the field empty, and possibly describe your intentions in the notes.